Have you reflected on what you learned in 2015 that you carry with you into the new year? Laura shares about grace. I am glad 2015 is complete. 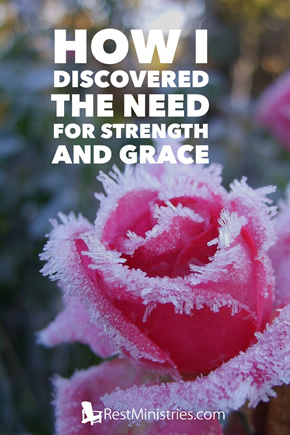 As I ponder the new year I have decided to focus on two words– strength and grace. I chose strength because when living with chronic illness we often feel weak. Our bodies revolt, family and friends don’t always understand the complexities of our illness, and we become frustrated. Living with chronic illness requires great strength–physically, spiritually and emotionally. Grace is favor, the free and undeserved help that God gives us to respond to his call to become children of God. God desires us to have grace, we have not earned it. Grace seemed to choose me as it resonated during my reading. Grace–polite behaving, but better yet a gift from God to allow His help, His mercies, and His forgiveness upon us. I learned many things in 2015, but one of the biggest was I cannot function in this world without God. He is there when I celebrate victories, but also present when I am in my darkest hours. The challenge for me is to remember this. I can count several times in which I failed to seek God in my most vulnerable state. And that inaction was not helpful, rather it was destructive, leaving me wallowing in self pity. I think we all have moments when we feel sorry for ourselves; whether it be from a lost relationship, life event, or chronic illness. Wallowing does not move us foreword and it serves little usefulness. We must garner strength and persevere, with the graces God provides. Prayer: Dear Lord, forgive me when I fail. Support me as I continue to do Your work and help me remember that Your grace is an amazing gift. Amen. Laura Seil Ruszczyk lives in New York with her husband and three kids. She retired from her job as an elementary school counselor in 2012. She is finishing writing a book about her journey with dysautonomia, the deregulation of the autonomic nervous system. When do you find God’s graces most helpful? Thank you for your devotional. Your words really resonated with me and reminded me of two daily goals – to live with strength and grace. And, Lisa, the song “That Was Then, This Is Now” also struck me today. Thank you both 🙂 Lisa E.
Laura, really love this insight you have shared today! You’re so right, how often I too will not turn to Him and allow the circumstances to become my focus. Yet if I take a moment to reflect, He gently reminds me of all the times He has granted His presence, peace, strength and grace! Thanks for this most important reminder!